31 Dec 18: The latest version, 3.6.0, of the free FISTS Log Converter program for Windows is now available. Straight Key Week (FISTS CW Club Europe) no later than 31 December. Ladder (FISTS CW Club Europe) no later than 7 January. Snakes & Ladders (EuCW; note S&L 2018 finishes on 31 December) no later than 7 January. Ladder Sunday 23 December 14:00-16:00 & 18:00-20:00 UTC. Day-hopper has three, 1-hour sessions per day starting at 0800, 1300, & 1800 UTC on each day. Upcoming days in December are Thursday 27th, Friday 28th. 20 Dec 18: The Autumn 2018 Key Note is now available to all current FISTS CW Club members. Ladder Sunday 09 December 14:00-16:00 & 18:00-20:00 UTC. Day-hopper has three, 1-hour sessions per day starting at 0800, 1300, & 1800 UTC on each day. Upcoming days in December are Tuesday 11th, Wednesday 19th, Thursday 27th, Friday 28th. 01 Dec 18: Straight Key Week (FISTS CW Club Europe), starts on Sunday 02 December and finishes on Saturday 08 December UTC. DON'T FORGET to add SKW to your logbook's Comment (or similar) field and that the operating times are 1 hour periods starting at the following UTC times: 0000, 0300, 0600, 0900, 1200, 1500, 1800, & 2100. Ladder Sunday 25 November 14:00-16:00 & 18:00-20:00 UTC. Day-hopper has three, 1-hour sessions per day starting at 0800, 1300, & 1800 UTC on each day. Upcoming day in November is Tuesday 27th. Upcoming days in December are Monday 3rd, Tuesday 11th, Wednesday 19th, Thursday 27th, Friday 28th. 14 Nov 18: The FISTS CW Club Europe BrassPounder November 2018 newsletter has just been published by David G4YVM, Activities Manager. This edition includes details of the upcoming FISTS Winter Sports and the October 2018 Ladder results. Ladder Sunday 11 November 14:00-16:00 & 18:00-20:00 UTC. Day-hopper has three, 1-hour sessions per day starting at 0800, 1300, & 1800 UTC on each day. Upcoming days in November are Friday 16th, Monday 19th, Tuesday 27th. Upcoming days in December are Monday 3rd, Tuesday 11th, Wednesday 19th, Thursday 27th, Friday 28th. 03 Nov 18: Graham G3ZOD writes: The RSGB Marconi CW 2m Contest is this Weekend, 3 November 1400 UTC - 4 November 1400 UTC. It is part of a Europe-wide contest and is the third out of three annual RSGB VHF CW contests (6m, 4m and 2m). Ladder Sunday 28 October 14:00-16:00 & 18:00-20:00 UTC. Day-hopper has three, 1-hour sessions per day starting at 0800, 1300, & 1800 UTC on each day. Upcoming days in October are Wednesday 31st. Upcoming days in November are Thursday 8th, Friday 16th, Monday 19th, Tuesday 27th. RST, Name, QTH, transmitter/receiver type, and FISTS member number (if applicable). 14 Oct 18: The FISTS CW Club Europe BrassPounder October 2018 newsletter has just been published by David G4YVM, Activities Manager. This edition includes details of Word Search 2018 and September 2018 Ladder results. Ladder Sunday 14 October 14:00-16:00 & 18:00-20:00 UTC. Day-hopper has three, 1-hour sessions per day starting at 0800, 1300, & 1800 UTC on each day. Upcoming days are Wednesday October 17th, Thursday 25th, Friday 26th & Wednesday 31st. 29 Sep 18: This year's Essex CW Amateur Radio Club (ECWARC) Boot Camp is on schedule for Saturday 27th October 2018. The doors will open at 08:30 for registration. The meetings begin at 09:00; please be sure to arrive in plenty of time to register. The day finishes at approximately 16:30. Your main decision is to decide which group you want to work with: under 10 wpm, up to 24 wpm, and 25 wpm up. Within each group, the aim is to show you how to progress to the top of that group and eventually move into the next group. Note that at times all groups are combined for a number of talks and group CW activities. This is quite an intensive day. If you become tired or don't want to do a particular activity, you can opt out. Have a coffee, or sit in on the station we'll have on the air. There will be someone to talk to about setting up and operating. You will be able to use the station yourself, supervised or not as you wish. If you plan to take the RSGB Morse test, please practice up to a speed of at least 2 wpm faster than the test speed you have nominated. It will also help the examiner if you can have your name, address, and call sign written out on a piece of paper in advance. We have only planned an hour for this activity as the number of delegates indicating interest was low. If the numbers swell on the day, it will have to be first-come-first-served. Morse key with 3.5 mm jack and 3.5/6.0 mm adaptor. High impedance headphones, same jack requirements. Name badge with call sign. Registration Fee £10.00 please bring correct amount (cash only). Plastic cups will be available. If you prefer something more solid, please bring your own mug. We will provide plenty of drinks, cakes, biscuits, and nibbles. If you require a more substantial lunch, please bring your own. Bear in mind we are only taking a 30-minute lunch break. This is going to be a very enjoyable and rewarding day. You will be able to put faces to names and call signs and meet new fellow-enthusiasts. But, most importantly, you will have a clear picture of your CW strengths and weaknesses and know how to fix and exploit those to improve your operating speed and technique. You will also be able to obtain information and answers about things that puzzle and confuse you: should I use a paddle key? What are all those different types for? How do I set up my straight key? What is the correct procedure for contesting versus regular QSOs? Which is the best CW software? And many more. Looking forward to meeting with you all and to a great day. 73 Dean G4WQI ECWARC Chairman. 27 Sep 18: New FISTS Collection disc with Morse courses and Key Notes from FISTS CW Club Europe! Beginners' training course by K7QO (MP3 format) with its read-back texts. G0NZA improvers' course (MP3 format). Complete archive collection of our magazine Key Note up to February 2018. Software, training videos and much more too. The disc comes with a 40 page A5 booklet giving advice for the newcomer to the hobby and the full text of the G0NZA training course. The prices are £4.50 (GBP) including postage to the UK, or for outside the UK, £5.50 (GBP). The package can be obtained from the club sales web page. Note: The old single discs are no longer available and all outstanding orders will receive this new package. 26 Sep 18: Straight Key Week from FISTS CW Club Europe, has returned for 2018 and starts on Sunday 02 December and finishes on Saturday 08 December UTC. DON'T FORGET to add SKW to your logbook's Comment (or similar) field and that operating times are 1 hour periods starting at the following UTC times: 0000, 0300, 0600, 0900, 1200, 1500, 1800, & 2100. Word Search runs during the whole of September, 24x7. It's not too late to join in and even if you haven't completed the phrase, you can still submit your log and see how well you did in the results table in October. Have QSOs with other members and use a letter from their callsigns to build up the phrase "ALFRED VAIL SPEEDWELL". Minimum exchange is member number. Bands are 160, 80, 40, 20, 15, 10 & 2m. Two sections: QRP and Open - you can include QSOs for both in your log. Ladder Sunday 23 September 14:00-16:00 & 18:00-20:00 UTC. Day-hopper has three, 1-hour sessions per day starting at 0800, 1300, & 1800 UTC on each day. The first day for 2018 is Monday 01 October. 15 Sep 18: The FISTS CW Club Europe BrassPounder September 2018 newsletter has just been published by David G4YVM, Activities Manager. This edition includes details of the August 2018 Ladder results. Ladder Sunday 09 September 14:00-16:00 & 18:00-20:00 UTC. 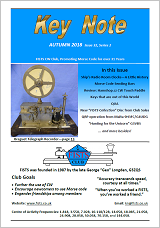 18 Aug 18: The FISTS CW Club Europe BrassPounder August 2018 newsletter has just been published by David G4YVM, Activities Manager. This edition includes details of the July 2018 Ladder results. Ladder Sunday 12 August 14:00-16:00 & 18:00-20:00 UTC. Word Search started on 01 June and runs until Sunday 30 September 23:59 UTC, 24x7. 29 Jul 18: The FISTS CW Club Europe BrassPounder July 2018 newsletter has just been published by David G4YVM, Activities Manager. This edition includes details of the June 2018 Ladder results. Ladder Sunday 22 July 14:00-16:00 & 18:00-20:00 UTC. Ladder Sunday 08 July 14:00-16:00 & 18:00-20:00 UTC. EuCW Snakes & Ladders new "summer/autumn"run started on 01 July and ends on 31 December UTC. Ladder Sunday 24 June 14:00-16:00 & 18:00-20:00 UTC. 22 Jun 18: UK amateurs: The annual RSGB 6m CW contest is Sunday 24th June, 0900-1200 UTC. 21 Jun 18: The FISTS CW Club Europe BrassPounder June 2018 newsletter has just been published by David G4YVM, Activities Manager. This edition includes details of the May 2018 Ladder results. Ladder Sunday 10 June 14:00-16:00 & 18:00-20:00 UTC. Ladder (FISTS CW Club Europe) no later than 14 June. 01 Jun 18: Today is the start of the Word Search activity from FISTS Europe. It runs from 00:01 to Sunday 30 September 23:59 UTC, 24x7. Have QSOs with other members and use a letter from their callsigns to build up the phrase "ALFRED VAIL SPEEDWELL". This is a 'first past the post' activity, so the sooner you start having QSOs for it, the higher you are likely to appear in the final results table. Minimum exchange is member number. Bands are 160, 80, 40, 20, 15, 10 & 2m. Two sections: QRP and Open - you can include QSOs for either or both in your log. For more information, please see the Word Search rules. Ladder Sunday 27 May 14:00-16:00 & 18:00-20:00 UTC. Word Search Friday 01 June 00:01 to Sunday 30 September 23:59 UTC, 24x7. 21 May 18: The latest version, 3.5.1, of the free FISTS Log Converter program for Windows is now available. This version adds support for the new Word Search activity (FISTS CW Club Europe). 19 May 18: The FISTS CW Club Europe BrassPounder May 2018 newsletter has just been published by David G4YVM, Activities Manager. This edition includes details of the April 2018 Ladder results. Ladder Sunday 13 May 1400-1600 & 1800-2000 UTC. 11 May 18: The RSGB 4m (70 MHz) CW Contest 2018 is Sunday 13 May 0900-1200 UTC. 22 Apr 18: The FISTS CW Club Europe BrassPounder April 2018 newsletter has just been published by David G4YVM, Activities Manager. This edition includes details of the March 2018 Ladder results. 22 Apr 18: The 2018 EuCW QRS Week activity is Monday 23 April to Friday 27 April inclusive. Call 'CQ' or 'CQ QRS'. Ladder Sunday 22 April 1400-1600 & 1800-2000 UTC. Ladder Sunday 08 April 1400-1600 & 1800-2000 UTC. Listen for Learners (FISTS CW Club Europe) no later than 7 April. Ladder Sunday 25 March 1400-1600 & 1800-2000 UTC. Listen for Learners activity (FISTS CW Club Europe) runs throughout March and encourages QSOs with newer members who joined on or after 01 March 2017. 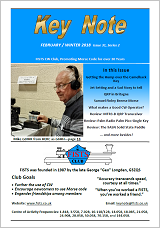 14 Mar 18: The February 2018 Key Note is now available to all current FISTS CW Club members. What makes a Good CW Operator? 13 Mar 18: The FISTS CW Club Europe BrassPounder March 2018 newsletter has just been published by David G4YVM, Activities Manager. This edition includes details of the February 2018 Ladder results. Ladder Sunday 11 March 1400-1600 & 1800-2000 UTC. 07 Mar 18: The latest version, 3.4.8, of the free FISTS Log Converter program for Windows is now available. This version adds support for 2m in the new Listen for Learners activity (FISTS CW Club Europe). Note that this works retrospectively; qualifying 2m QSOs starting from 01 March will be included when sending a log in at the start of April. It also includes fixes for several issues. 28 Feb 18: The new Listen for Learners activity (FISTS CW Club Europe) runs throughout March and encourages QSOs with newer members who joined on or after 01 March 2017. See the Listen for Learners rules for full details. The latest version of FISTS Log Converter, 3.4.6, supports Listen for Learners for 160m-10m. A newer version will be available within a few days that adds support for 2m. 27 Feb 18: The latest version (3.4.6) of the free FISTS Log Converter program for Windows is now available. Ladder Sunday 25 February 1400-1600 & 1800-2000 UTC. "Listen for Learners" starts on Thursday 01 March and runs throughout March - final details to be announced soon! 11 Feb 18: The FISTS CW Club Europe BrassPounder February 2018 newsletter has just been published by David G4YVM, Activities Manager. This edition includes details of the January 2018 Ladder results and the upcoming Listen for Learners Activity. Ladder Sunday 11 February 1400-1600 & 1800-2000 UTC. 08 Feb 18: The latest version (3.4.5) of the free FISTS Log Converter program for Windows is now available. This version adds support for the new DXCC entity 'Republic of Kosovo'. 03 Feb 18: The FISTS CW Club Americas Winter Slow Speed Sprint (max. 13 wpm) takes place on Saturday 3 February 1700-2100 UTC on 80m, 40m, 20m, 15m & 10m. Ladder Sunday 28 January 1400-1600 & 1800-2000 UTC. 19 Jan 18: The final Cumulatives Report from FISTS CW Club Americas has been published by Dennis K6DF. This newsletter contains the results and soapbox comments for the Cumulatives on-air sessions during 2018. Please note that the Cumulatives have now finished and are not running in 2018. Congratulations to the certificate and key winners and thank you to everyone who has participated. 17 Jan 18: The FISTS CW Club Europe BrassPounder January 2018 newsletter has just been published by David G4YVM, Activities Manager. This edition includes details of the final results for the 2017 Ladder and Straight Key Week. Ladder Sunday 14 January 1400-1600 & 1800-2000 UTC. Cumulatives (FISTS CW Club Americas) no later than 7 January. Straight Key Week (FISTS CW Club Europe) no later than 7 January. 01 Jan 18: The "winter/spring" EuCW Snakes & Ladders run starts today, Monday 01 January, and finishes at the end of 30 June (UTC). If you've not participated previously, now is a great time to start. QSOs must take at least five minutes, stations contacted must be European stations and the mode must be CW. Each station may be contacted once per day, irrespective of the band.